Latest news from the author of Pink! Recently I had my inaugural visit to Comely Park Primary School, where I was introduced to pupils and staff as their new Patron of Reading. A huge hall with over 400 children greeted me, and it was at this final whole-school assembly that I was able to say how honoured I was to be “adopted” by the school to encourage a love of reading and writing. 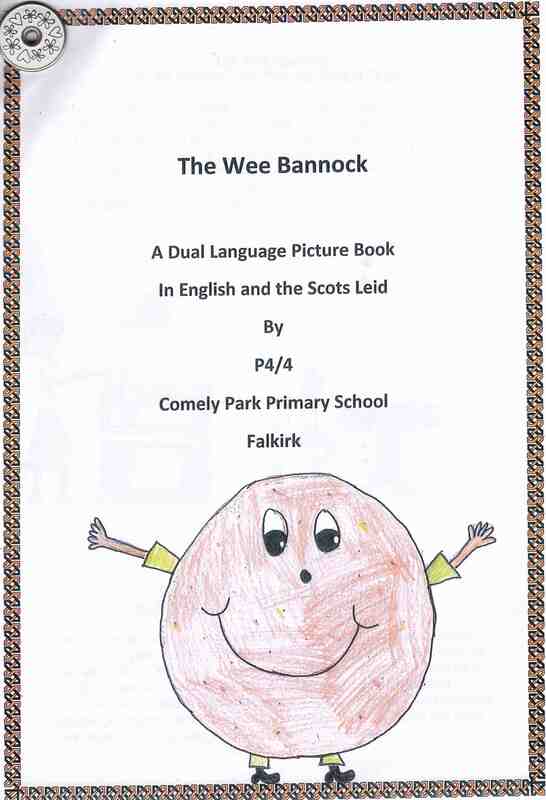 My first task as Patron was to announce the winner of the School Makar, an honorary post for one lucky pupil who will write poems about school events. 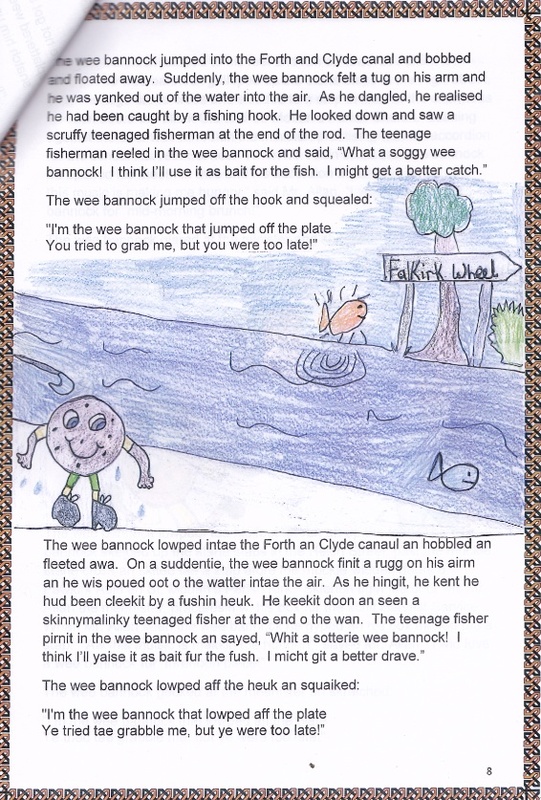 The winner was Ruby in P5/1, and she will have her work published in the school newsletter and here on my blog. Following our presentation, Yvonne Manning of Falkirk Libraries told everyone about the Summer Reading Challenge and encouraged pupils to choose six books on this year’s Creepy House theme to read over the holidays. Children can also design their own scary monster, get ideas for books they might try and enter competitions HERE. Once the assembly was over I went round a number of classes to chat with the children and read them stories. My able guides Kelsey and Logan took me round the whole school and looked after me very well! You can see that the little rhyming verses are written in the Scots Leid which is something I am not an expert in at all! 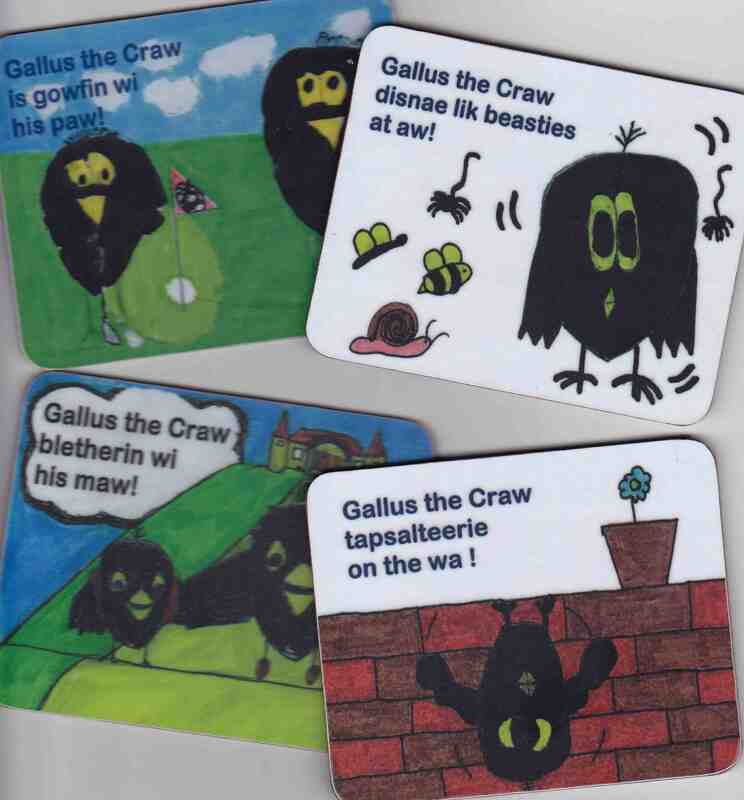 I understood the first three: Gallus the crow is golfing with his dad; Gallus the crow doesn’t like insects at all; Gallus the crow is chatting with his mum; but the last one had me stumped! It had a new Scots word I’d never seen before: tapsalteerie. As you can guess from the picture, it means upside-down. Gallus the crow is upside-down on the wall. 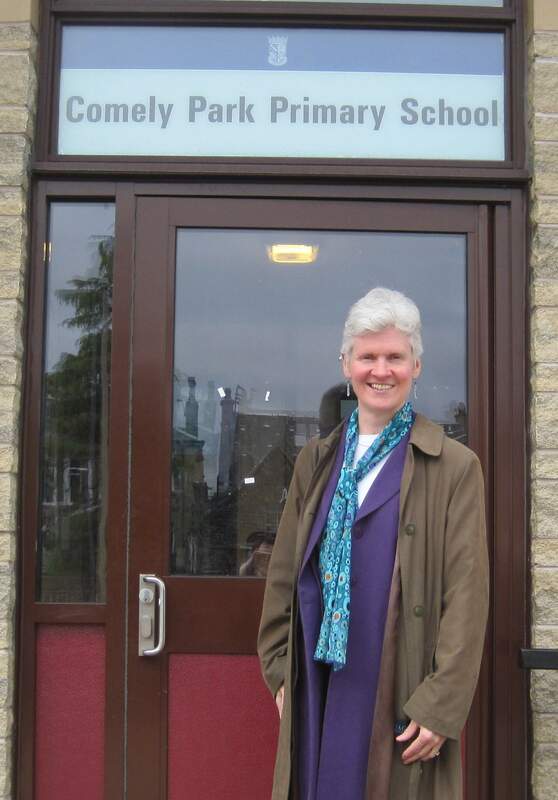 I’m looking forward to the new school term when I can go back to Comely Park Primary and work with the children on a wide range of exciting projects! In the meantime, have a great holiday, everyone! 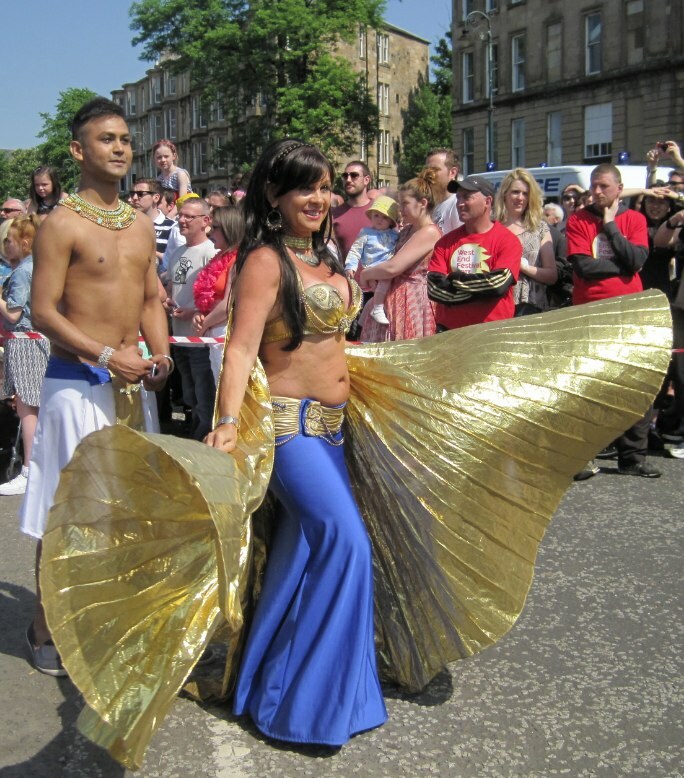 This Egyptian queen was part of a bellydancing troupe. 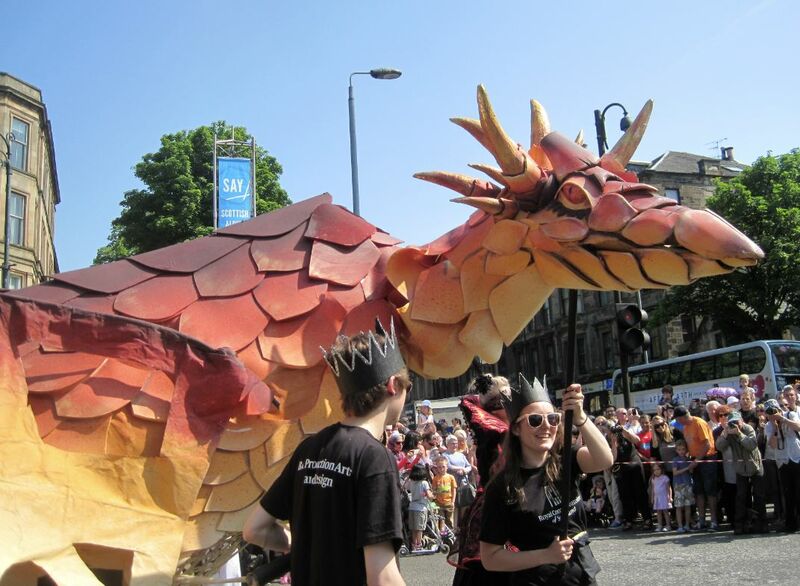 It’s festival time again in Glasgow and we had a fantastic, sun-drenched weekend for the annual parade! Every year it gets bigger and better as more musical and community groups get involved. 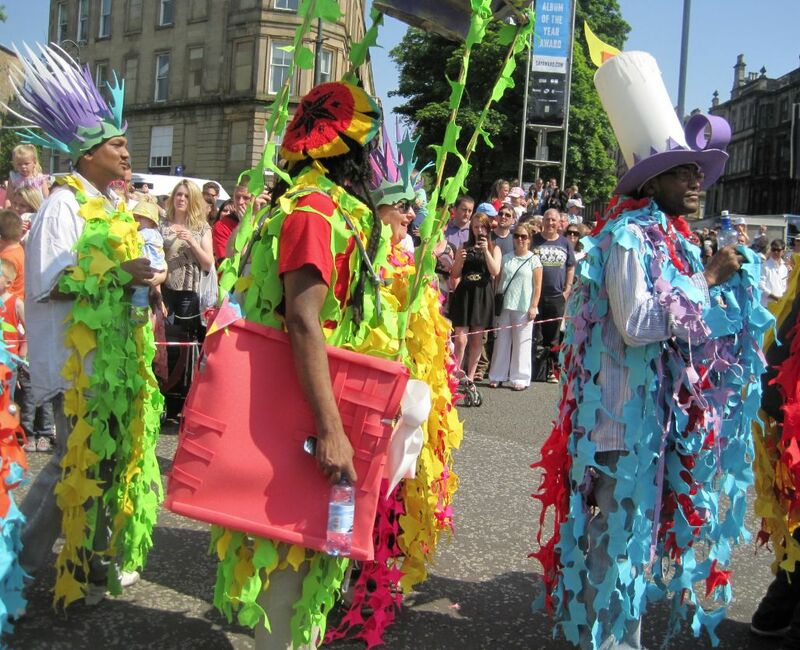 Judging by their elaborate costumes and spectacular props, some of them must spend the whole year getting ready! 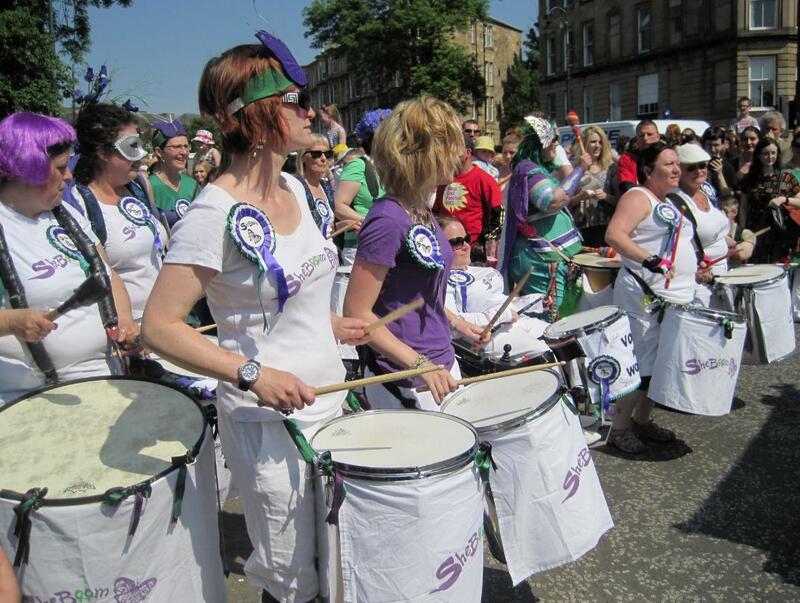 SheBoom women’s percussion band, who once appeared on Britain’s Got Talent! This year I managed to get a spot with a clear view so I took tons of photographs. (Normally I’m stuck behind crowds of people, and being short I end up seeing only a few bright feathers and flags pass by overhead!) There were lots of percussion bands with drums, trombones, bagpipes and other instruments. The one above is SheBoom, who play African-Brazilian and Celtic rhythms. I loved the tropical colours of these “glad rags”! 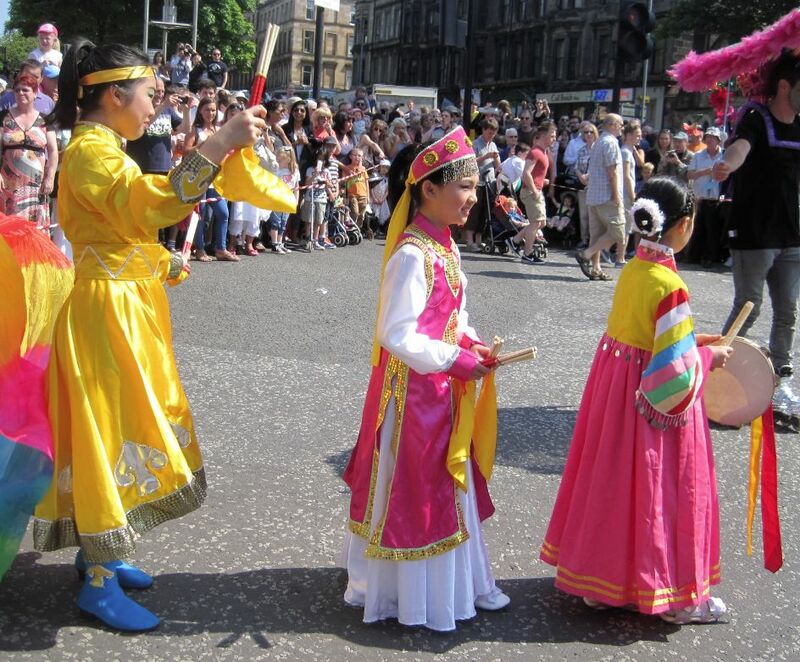 There were dancing groups too from all over the world, who waved scarves or dressed in colourful costumes. The group above look like they’re from Jamaica, but there were also representatives from China and other communities who have settled in Scotland. The beautiful silk costumes of the Chinese troupe. 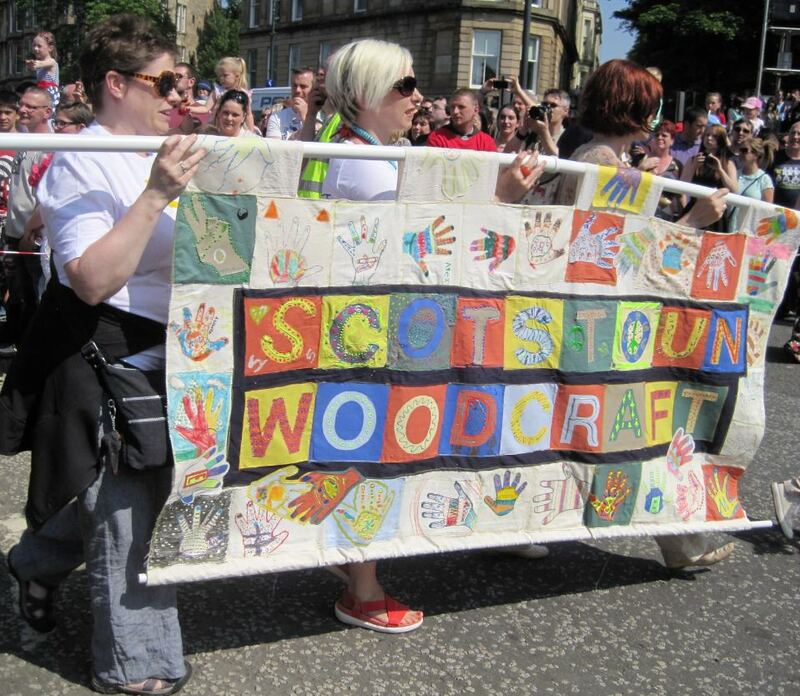 Some of the participants were artists, like the Scotstoun Woodcraft group who created an impressive banner for the parade. The Royal Conservatoire of Scotland also took part, and the BA Production Arts & Design students had made some amazing costumes and props on a “Fairytales of the Unexpected” theme. 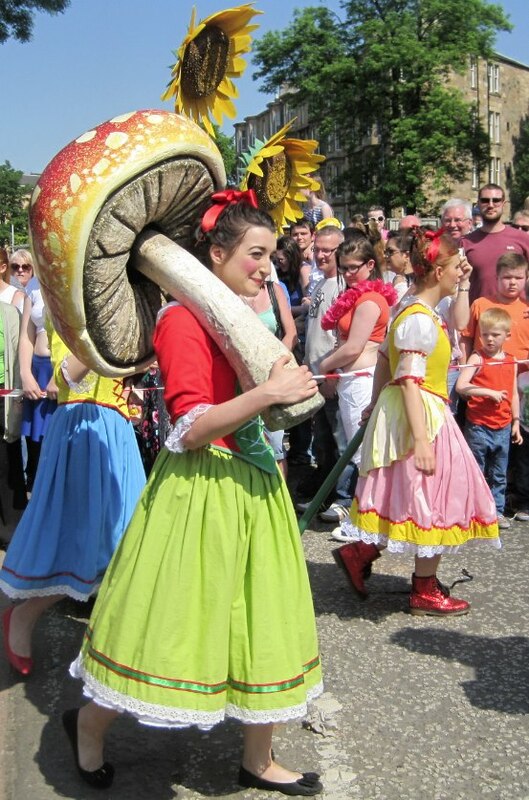 Some traditional fairytale costumes and a rather splendid toadstool! And look at this dragon! I would love to make something like that! There were two enormous traditional Chinese dragons as well, with lots of people walking underneath to support their long, snake-like bodies. As you can imagine, it was impossible to get a whole dragon in any of my photographs! 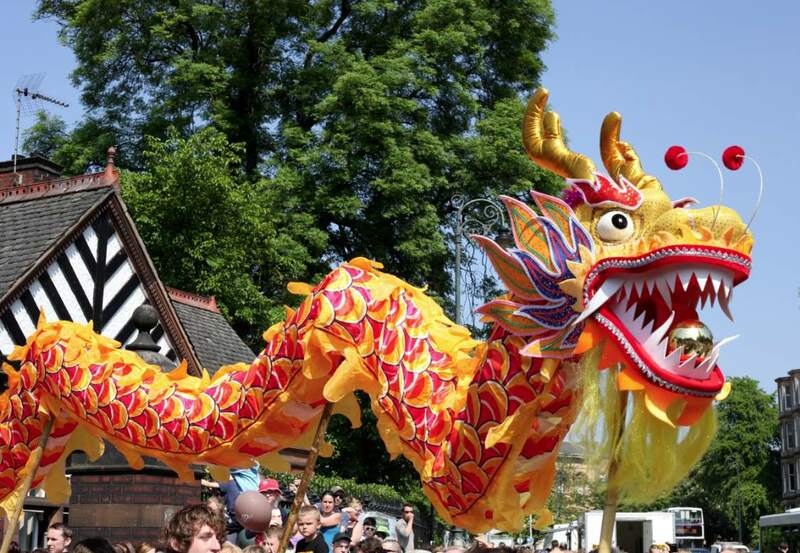 One of the beautiful Chinese dragons at the parade. Another artistic group taking part in the parade was a group of young women dressed in cardboard paper-doll cutouts. 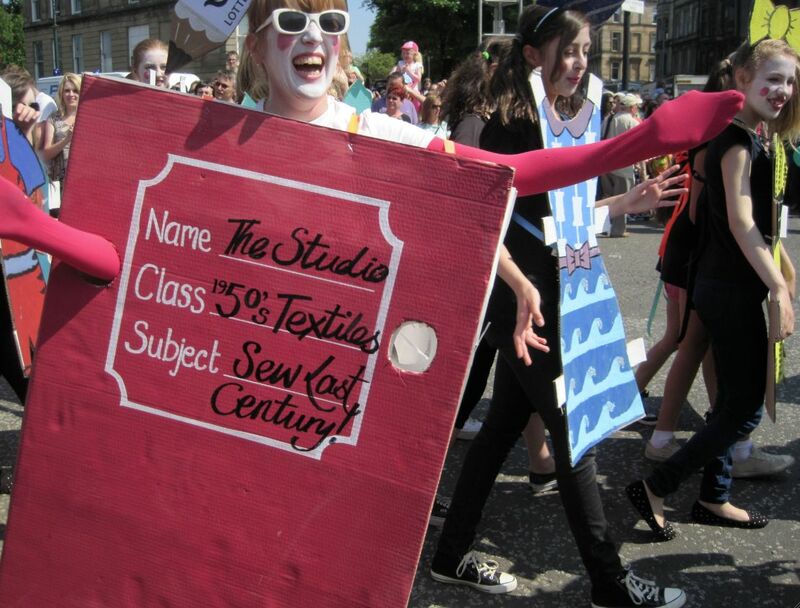 They were called The Studio: Sew Last Century, and they are a Partick-based textile club for 10-18-year olds. The paper dolls represent 1950s dress design which is something the group have been researching in the Glasgow School of Art Archives and Collections. This big pink billboard really got my attention! 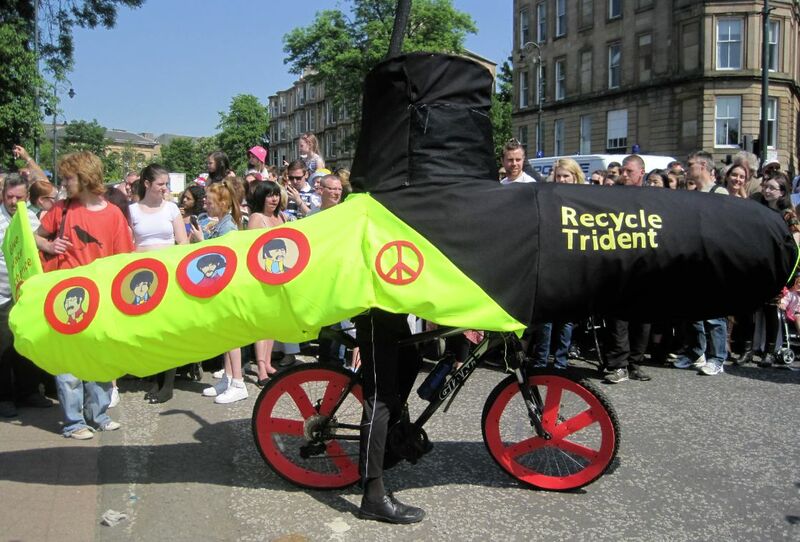 This group wants to recycle Trident and make it a yellow submarine. 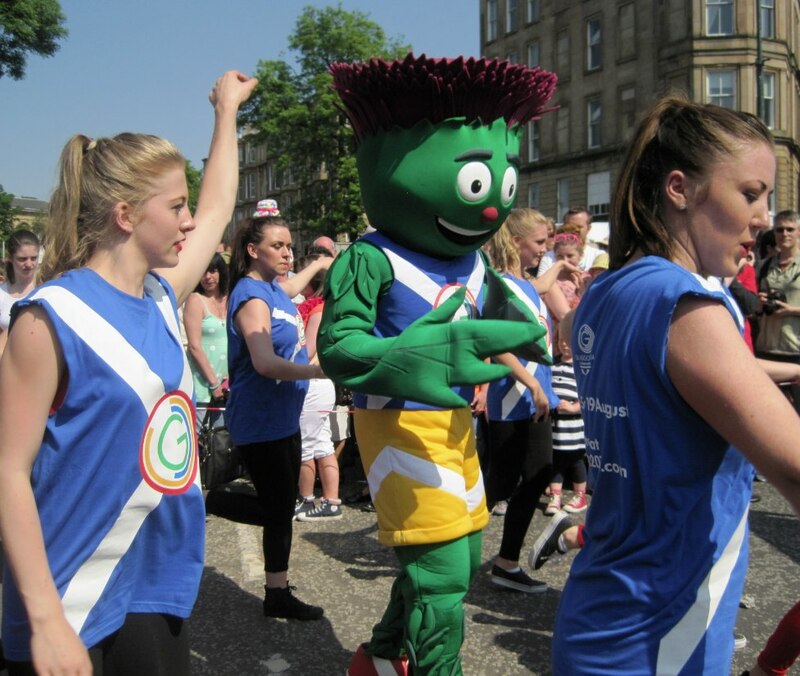 Celebrating the Commonwealth Games in Scotland next year. Although I was just a spectator at the parade, I actually made a little contribution to the festivities myself, spending an hour in the Botanic Gardens where a lovely quiet space has been created for children and families. 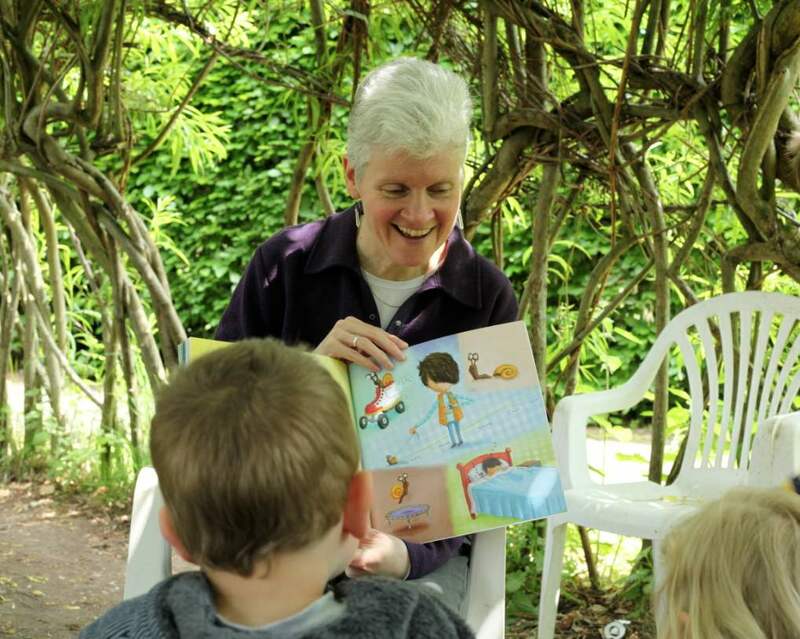 It’s called the Children’s Garden, and in the fragrant and shady willow house I sat and read stories with a group of chatty youngsters. It was the perfect end to a brilliant day!